18+ This novella contains explicit m/m sexual content, graphic language, suggestions of multiple partners, and some violence. Over 36,000 words long. 36,000+ wrds, Published September 9, 2016. 5.0 out of 5 stars Sooooo hot? I love Sadie's take on fantasy. Hot elves, one confused halfling and a fateful trip through the forest make for a story that kept me up waaaaay past my bedtime (sleep is overrated anyway?). I will most certainly read her revamped storyline when it comes out, I can't wait. I've been serial reading Sadie Sin this week and she is awesome. Her characters lure you in and make your heart race. Every book designed to give you a reminder of why Kindle's are a addicting: instant gratification. 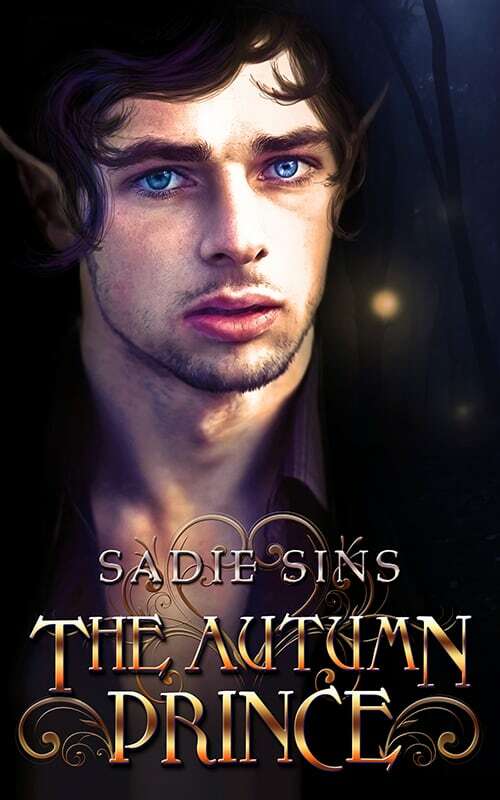 In her latest work, The Autumn Prince, Sins is giving us a break from her nail biting, Kindle tossing cliffhanger's. Focusing on a man who's been hiding his true nature his entire life, afraid if someone discovers his secret he'll die. The Autumn Prince is a story about a kind hearted halfling who's a badass with a temper, a Prince with a filthy mouth, and how these two come to meet. Once again Sadie delivers. I love her books and the way she tells her stories, and this one is no exception. To date my absolute favorite is still Demon Arms, if you haven't read it I highly recommend it. In any event you can't go wrong with any of her books. The night was alive with great power. The sky was full of the chill energy of the late season, when fires lit the sky and burned the leaves crisp and brown. It was the flash of life, snuffed out and crackling raw as winter came close to claim it silent. Eaves was familiar with this feeling, the tightness in his chest, the prickling of his senses, the racing of his blood as night sang through him. He had watched young and old alike come alive, flush rushing across their skin to glow warm, eyes alight and reflecting the mad ache of things that could only be felt and never fully understood. They were compelled, dancing in this power, kneeling in the dirt. Some were driven to the brink of madness, and some lifted further still by Siren’s call moaning through the restless wind. Not all humans were struck, but the ones with remnants of the old blood were destined to answer the call tonight. As for the beings brimming with the same blood, ancient as the night and the moon that ruled it, they joined their voices in wild chorus to fill the wind with the madness that only All Hollows Eve could bring. Wild. Raw. Insane. Each chill breath stung Eaves' lungs and set him free. Each long stride brought him deeper into the dark forest and away from the structure and bars that only humans could create. Each movement undid him. His humanity unwound from him like a cloak, stripped him of his order beneath his well controlled glamours. He’d known this feeling many times in the safety of his studio with a brush in hand and a large assortments of colors laid out before him, but never within the forest. He had never been so brash to travel here when the Ancients were calling. Tricksters, thieves, death dealers; this was their hour. Among them, Eaves feared it would be his as well. Eaves did not fear the Ancients in the way the humans he lived among did. He had no false delusions of them either, like the whimsical daydreamers that would skirt the edge of the trees, looking for adventure with a stray nymph. Their dangers and their treasures were as clear to him as the stars in the cloudless sky. He had no fascination or prejudice for them. Of the supernatural beings that he had met, all had gleamed his indifference from his aura as simply as one smelling a scent and let him be. Tonight, he found, was not to be the same. It was not a full shock, given the way his heart was aflame as dark settled around him. Eaves had never walked the woods when the madness had been so close, thrumming in his veins, pulsing in his throat as if its fiery burn had taken over what his heart once was. Perhaps it had. There were very few of what Eaves was, killed before a chance to grow to his twenty some years and impressive physical strength. He had no one to ask if the madness was to be expected as he walked the woods. The one before him might know, but to reveal what Eaves was would be to signal for an undesired death. The elf stood tall and willowy even though the well fitted armor he wore was undoubtedly heavy. Eyes the crisp gray of a clouded morning, he had taken one shrewd look at Eaves from behind the torch he held in hand and had seen something no one else had noticed of the young man in his years of walking the Earth. With the intricate crest of the Autumn Guard flickering gold on his sword and chest plate, the sixth sense must have been trained in the elf the same way a child learns mathematics. Looking at Eaves, the elf could see numbers were not adding up. “Your business,” the elf demanded with all the affluence of the high bloods speaking to dust that had ended up on their robes. The tone always made Eaves bristle, but tonight was not the time to indulge in mockery and most likely a scuffle with an empowered beanpole. Granted, Eaves was nearly the same impressive height but his time around the short humans had created a familiar vision of society he was hard pressed to replace with lanky, graceful snobs with familiar wildness in their eyes. Eaves did not step back at the prodding of the elf, the tall creature’s mouth hardening at the realization that his intimidation had fallen short. The human traveler seemed more a wild jackal than a man, dressed in black with shoulder length dark curls unruly and windswept and a week's worth of stubble rough on his jaw. He was built human, wide shoulders and thick thighs lacking the compact grace of the elves, even for such a tall stature, but there was something wrong about him. Something that made the elf consider the ease of which it would be to just slew the man before him now. The human's eyes were light as sky, nearly winter's color, and not belonging in any mortal's face. Eaves considered himself a cautious person, keeping his head down and mouth shut when needed. Elves were dangerous, and the one before him guarded a prince, making him deadly. Of course, the guard could have just run him through on principle alone, so in that regard, Eaves found him to be at the very least patient. Eaves would show similar restraint, even with the wind whirling his blood into a frenzy of wild energy. Leaves rattled under the elf’s soft shoes, too slow to blow free from the swift predator. And predator he was for Eaves recognized his ilk deep within the gaze that was currently trying to deduce his motives. Elves were not all flowers and gentleness. The Autumn Guard especially were known for their wild ruthlessness, matched only by the frozen mercy of the Winter Blade. Eaves birth had fallen on the cusp of the two destructive seasons, autumn full of fire and passion, and winter an all encompassing eternity of cruelty. If Eaves had been of the elves, he would have been cast into the ether with the other wild entities that had no symbol to identify them, too raw for the complexities that life called for. Elves were not beings to be trifled with. Eaves knew the elf noticed something in him but not what. Hopefully it would remain that way. He had never faced the Autumn Guard but he suspected that they would be the ones to kill him if he was recognized for what he truly was. “You carry no medicine,” the elf finally pointed out, not exactly happy to allow the man passage. The festival always drew the worst of trouble as it was, and he did not like the idea of stray humans mucking up their elaborate ceremonies. “I am the sort of man that has no wife, nor wish for one,” Eaves snapped, raising his chin defiantly while internally cursing his temper. He was not himself tonight, tongue included. The elf met his glare, understanding flashing over his face before quickly disappearing within his emotionless expression. Eaves didn't know, nor did he care to know, what elves thought of men laying with men. It was taboo enough among humans outside of his village, and he should have just kept his mouth shut. “My sister is not prone to illness,” Eaves continued, hoping to change the subject to something less likely to get him slayed. “She is a hearty woman with a strong mind. Her family depends on her and I love her dearly. Nannying and weatherproofing their estate is hardly a lot to ask, even with the three days journey on foot. A journey I would like to continue,” he added tightly. Eaves almost asked if the elf would destroy any child he sired, human or not, but kept himself in check. “Get her a dog,” he said flatly, stepping smoothly around the tall intrusion. He had no head for conversation tonight, worry and the energy in the air making him want to move, and roar, and nothing more. The line of conversation was too personal and dangerous to indulge in anyways. Sighing, Eaves paused and turned back. “What conditions would those be, good elf?” He asked with frustration clear in his voice. Taking a long assessing look at the brown haired, gray-eyed fae who looked to quietly manifest the madness singing in his own body, Eaves internally shivered at the implications. Elves battling for territory was not a place anyone wanted to be found in, especially when the battle would be with the oncoming Winter Blade. “I’ll keep that in mind. Now if you’ll excuse me.” He bowed briefly to the elf and turned on his heel, making his way down the path before another could try and stop him. “Stay to the left fork, mortal,” the elf called as Eaves disappeared into the darkness. Gilroy stared long into the dark, listening for sounds that did not come. The mortal was more a specter than a man, but he had not discerned any ill will. His instincts warned of the odd appearance of a human traveling alone on this of all nights with no weapon or power to protect him that could be seen. Only a fool would be so blithe, and the brief conversation had led Gilroy to believe the man was hardly dim witted. He hoped he would not find himself regretting his decision to let the stranger pass.